So I while I trying out creating my own curves with the Quick Curve Ruler, I decided to make my test block into a potholder. Because well our potholders have been around since my husband and I got married 8 years ago and I just haven't gotten around to making any. 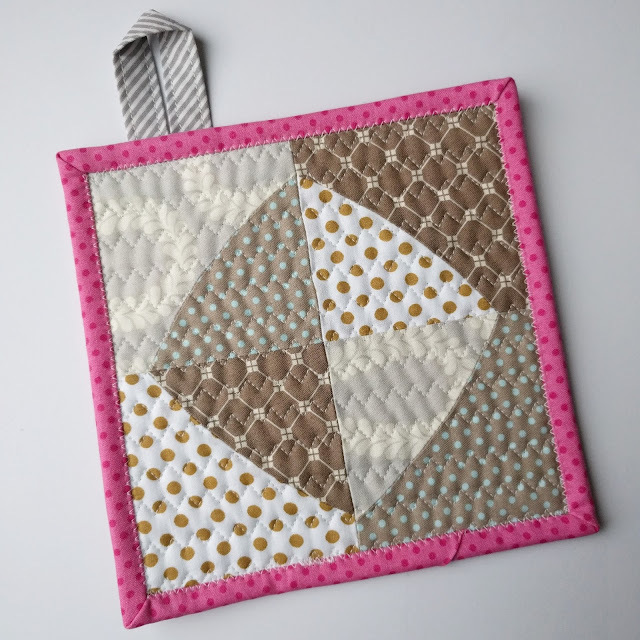 I love how this little potholder turned out. Just a slight curve, I learned from my test block and will be trying for a little more noticeable curve, but that is for another time. As for the quilting, I selected the triple stitched zig zag on my machine and love the effect. Then to secure the binding down I did a small zig zag that covers the entire back of the binding. So it should handle multiple washes just fine! I love a project that is practical and it uses up some of my random scraps squares. I have actually been doing a lot of scrap sewing lately and I'm so happy that I've used up most of them. I guess it will be time for me to create some new scraps!! That turned out great and will be a useful finish! Great potholder! I love making potholders, so quick and easy and they make such great gifts!